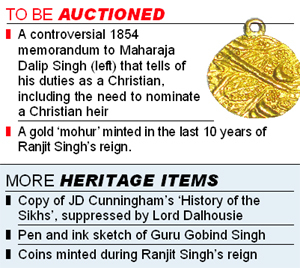 A controversial 1854 memorandum to Maharaja Dalip Singh that tells of his duties as a Christian, including the need to nominate a Christian heir, is being offered for auction tomorrow (Thursday) in the UK. The author of the hand written memorandum is Sir John Spencer Login, who was appointed by the East India Company as guardian to the young and inexperienced heir of Ranjit Singh, shortly after he was deposed by the British in 1849. Some memorabilia related to Maharaja Ranjit Singh (in pic) also to be auctioned; and (right) German prayer book given to Dalip Singh. Born in 1838, Dalip Singh was Maharaja Ranjit Singh’s youngest son. Following the infighting after Ranjit Singh’s death in 1839, Dalip Singh was crowned in 1843, deposed in 1849, converted to Christianity in 1853 and exiled to the UK in 1854. The fabulous Kohinoor diamond, part of his inheritance from Ranjit Singh, was taken from him and given to Queen Victoria. Nothwithstanding the efforts of the British authorities at the time, Dalip Singh responded to the call of his Sikh roots some 33 years later. Helped by his cousin, Sardar Thakar Singh Sandhawalia, he returned to the Sikh fold in 1886 in the port of Aden during an unsuccessful attempt to return to India and the Punjab. Login’s memorandum is a timely reminder of the enormous efforts to brainwash Dalip Singh as part of a larger plan to prevent him from reclaiming his once powerful and extremely wealthy kingdom. It was a measure of the Punjab’s importance (both strategically and financially) that when Login retired a few years later he was granted an annual pension of £300, which today would be worth £800,000 pounds (nearly Rs 6.5 crores) per year. The memorandum is part of a larger collection of Sikh, Punjabi and other Indian memorabilia that is being sold by Mullock’s auctioneers in the English county of Shropshire. Among them is a German prayer book foisted on the young Maharaja, as part of the relentless efforts by the colonial powers to persuade him to give up his religion, roots and homeland. Other items put up for sale include 19th century maps of the Punjab, assorted prints of the Golden Temple, a seated statue of Ranjit Singh, a drawing of Guru Har Krishan, a pen and ink sketch of Guru Gobind Singh and a print of Shaheed Bhagat Singh who was hanged for his revolutionary activities in 1931. Some other objects of interest include a gold mohur - known as a Nanakshahi - minted in the last 10 years of Ranjit Singh’s reign. According to experts of the era coinage was never issued in the name of the rulers, but always in the names of Guru Nanak and Guru Gobind Singh. Ranjit Singh’s coins had the distinguishing marks of a tree leaf and later a peacock’s feather. They were struck at Pind Dadan Khan, Jharig and Peshshawar. The first of any newly struck coins were customarily sent to Amritsar as an offering at the Akal Takht. Also available to purchase is Captain J.D. Cunningham's 'History of the Sikhs’, published in 1849, in which he reveals how some Sikh generals were in the pay of the British during the Ist Sikh War. For his efforts, Cunningham was demoted and died soon afterwards. This edition of his book was suppressed on the orders of the then Governor General, Lord Dalhousie. In his 1854 memorandum Login tells Dalip Singh, "By the Treaty of Lahore you have wisely given up your political position and pretension to sovereignty for yourself and your descendants." He goes on to advise the Maharaja of the wisdom of remaining in England and marrying into a family of "high character and befitting rank", adding that if he should have no children of his own he should adopt an heir "who has been educated in and embraced the Christian faith." In the event Dalip Singh married two Christian women. The first was Bamba Muller, the illegitimate daughter of a German banker and his Ethiopian mistress, with whom he had six children, including two boys who were educated at Eton. After Bamba died in 1887 he married Ada Douglas Wetherill with whom he had two children. None of the eight children had any legitimate issue of their own. So to all intents and purposes Ranjit Singh's dynasty ended with Dalip Singh. For specialist collectors one final item of interest is another memorandum - this one running to six pages - that details how Dalip Singh's minister signed away his sovereignty in return for pensions and privileges for themselves. They included Gulab Singh who was allowed to purchase the "Province of Cashmere" for Rs 68 lakh.